Our re-runs of an Ultra Swank world are interrupted by a shrill tone from the television. ‘Howdy Dooty’ and Mom’s favorite soap opera are suddenly replaced by a Civil Defense symbol and gravely intoned warnings of the END OF THE WORLD! High above the utopian suburbs of plenty, an ever present overcast of death and despair loomed. The Cold War was a monstrous chess game played out by the Super-Powers. The stakes were life and death of the entire world. Protection from the fallout of Hydrogen Bombs was possible. Contrary to popular myth, radiation would drop to safe levels after only two weeks. 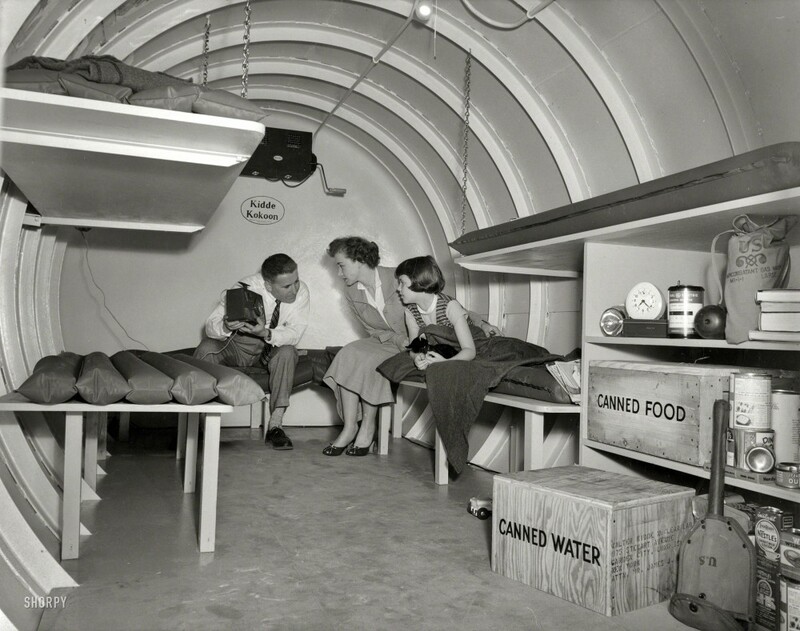 During the 1950’s a program of creating mass shelters in urban areas was undertaken. If not at the epicenter of the blast, a life-saving radiation shield could come from only several feet of masonry or simply retreating to a deep basement. Millions of lives could be saved. But what of America’s suburbs and rural areas? Total Thermonuclear War would spread fallout dust far and wide. Out there, population was spread thinner and there were few large, massive buildings to provide radiation shelter. Yankee Ingenuity and All-American know-how trumpeted the answer. Build you own family shelter in the backyard! Overnight, popular magazines were filled with blueprints and local hardware stores stocked up on the necessities of Armageddon. The concept appealed to the legions of America’s newly affluent middle class. Self-reliance! Do it yourself resourcefulness! Besides, who really wanted to spend two weeks locked up with a bunch of suffering strangers? The weak, old and ethnically suspect? Your own private family shelter could be like an underground vacation cabin. Stocked with sanitized food and modern necessities, your little tribe could wait out the unpleasantness above and emerge to start a new and more pure way of life! In reality very few private shelters were actually built. What seemed like a great idea at first had a few inconvenient drawbacks. It cost money. Money that could go for a new washing machine, paying down the mortgage or saving for Junior’s college education. Spending money on a hole in the ground to hide from the end of the world was… depressing. Then there was the little problem of the neighbors. You built a shelter but they didn’t. When the sirens started to wail you knew who would be pounding on that thick steel door you just ordered. Was there room for one or two? How about all of Maple Street. What about that nice old couple over on Elm? Maybe just let in the children? Infants and up to 10 years. Older kids were annoying anyway! The whole concept was depressing. It was all as dark and creepy as the condition of the few backyard shelters that actually did get built. I think there were more ‘Twilight Zone‘ episodes about the theme of family shelters- than real ones constructed in my neighborhood. Not long after the pictured Life Magazine article of September, 1961, with it’s sobering letter from JFK himself, official Civil Defense planners began moving away from the family shelter concept. Hope triumphed over fear, ‘Maverick’ and M&M’s over megatons. Above: It is interesting to note- the famous ‘Twilight Zone’ episode The Shelter, aired just two weeks after our LIFE magazine article.